Every now and again I bring this video up that was taken during an impassioned moment one day where I noticed everyone was getting down about the scale regardless of the million and one positive things they were doing with their lives in that moment that the scale wasn’t giving them ANY credit for. I’ve already shared this video on Timetorebel.com, but never highlighted it. So… Here it is, highlighted. 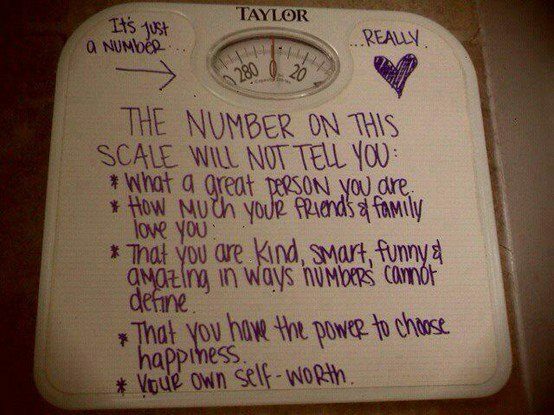 Remember, the scale is strictly a barometer for your journey. A measuring tool that does NOT define you. It can be frustrating and it damn sure is necessary, but NEVER should a scale be the deciding factor in how you feel about yourself. NEVER should the scale discredit the better eating you’ve done, increased exercise levels you’ve been working so hard for, or the self worth that seems to come and go like a psychotic roller coaster on days where the scale isn’t “telling you what you want to hear.” If you let an inanimate tool like a scale judge all your living, breathing, animated movements… Well then I will go on record that you are silly. Simple and plain, you are the silliest of gooses who needs a smack of reality that YOU are the King or Queen of your own castle… The scale is simply the jester. You call it in when you need it, take what you need from it, and move on with the recognition that you are defined by your love for yourself. What you see on the outside is a reflection of how you feel about yourself inside. Until you learn to love yourself, you’ll always see ugly in the mirror. Speechless my friend! I meant every word I said to you the last night of conference. You have an amazing gift.